American orbital launch vehicle. 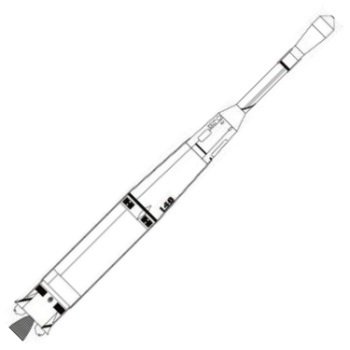 Thor with Able stage derived from Vanguard second stage. Status: Retired 1958. First Launch: 1958-04-24. Last Launch: 1958-07-23. Number: 3 . Payload: 120 kg (260 lb). Thrust: 667.20 kN (149,993 lbf). Gross mass: 51,608 kg (113,776 lb). Height: 30.00 m (98.00 ft). Diameter: 2.44 m (8.00 ft). Apogee: 640 km (390 mi). 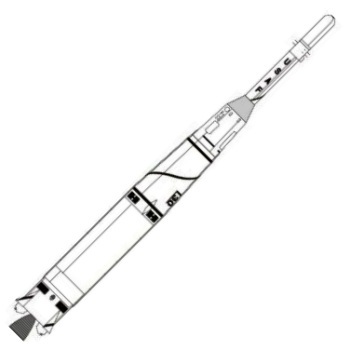 In October 1957, Paul Degarabedian, an Associate Manager at Space Technology Laboratories (later TRW), proposed an American lunar/interplanetary launch vehicle combining the Air Force Thor IRBM; with the second and third stages of the Navy's Vanguard satellite launcher. This idea didn't make it past his management, but a month later he proposed a two stage Thor Vanguard, which he called the Thor A or Able, for test of subscale models of ICBM warheads. This was of interest, and within a month an order was placed with Aerojet for several Vanguard second stages. The STL team used the Thor's own guidance system, and built the payload interface compartment and ejection actuators in-house. It was also necessary to add 84 kg of ballast to prevent the two-stage missile's payload from overshooting its south Atlantic impact area and hitting Africa. STL Electronic Laboratory's George Mueller, later a key NASA manager in the Apollo program, was made project manager of the $1.55 million classified program. The first tests of the Aerojet Able stage began on February 21, 1958. The first Thor stage arrived on March 4. It was decided that the nosecones would carry an instrumented mouse to see if it could survive boost, sustained zero-G, and re-entry. Three weeks later the integrated tests were completed and the booster was declared ready for flight - only four months after it was conceived! The first launch attempt on April 23 ended at T+146 when the Thor exploded due to a turbopump main bearing failure, and mouse Mia (inauspiciously named 'Missing In Action') perished. The same problem had occurred on other Thors and it took a while to identify the cause, take corrective action, and fix the turbopumps in the field. The second launch on July 9, with a ballistic nosecone and the Mouse Mia II aboard, was successful, although the nosecone could not be located by the recovery ship before it sank. On the third launch, on July 23, telemetry indicated that mouse Wickie survived the flight into space through splashdown. But again the nosecone was not located. This completed the nosecone tests. In February it had been suggested that the configuration could be converted into a low-cost ICBM, dubbed Thoric (Thor Inter-Continental). This was an obvious threat to the Atlas program and got nowhere. Thor B or Thor Baker was to use the three-stage combination originally proposed in October 1957 to allow the Air Force to send the first space probe to the moon. It was renamed Thor Able-I and the first launch attempt on August 17 was thwarted when the first stage failed at T+70 seconds. The next month NASA took over the program, and the Thor Able-I's payloads became the first of NASA's long series of Pioneer deep-space probes. The USAF used an upgraded version of the Aerojet Able stage for another series of reentry vehicle tests in 1959, while NASA and DARPA continued to use developed versions of the rocket for launch of Explorer, Transit, and Tiros satellites. Finally the addition of solid rocket boosters allowed larger upper stages to be carried and payload to be increased in the Delta series of rockets. The evolutionary descendant of the Thor Able, the Delta 7000, was still flying in the 21st Century. Payload had increased from 100 kg to over 5 metric tons, and the Delta was the most reliable and economical launch vehicle ever produced in the United States. LEO Payload: 120 kg (260 lb) to a 640 km orbit at 48.00 degrees. Flyaway Unit Cost 1985$: 8.930 million. Stage 2. 1 x Able. Gross Mass: 2,268 kg (5,000 lb). Empty Mass: 816 kg (1,798 lb). Thrust (vac): 34.300 kN (7,711 lbf). Isp: 270 sec. Burn time: 115 sec. Isp(sl): 240 sec. Diameter: 0.84 m (2.75 ft). Span: 0.84 m (2.75 ft). Length: 6.57 m (21.55 ft). Propellants: Nitric acid/UDMH. No Engines: 1. Engine: AJ10-101. Status: Out of Production. Family: orbital launch vehicle. Country: USA. Engines: LR79-7, AJ10-101. Spacecraft: Pioneer 0-1-2, S-2, Transit, Pioneer 5, TIROS. Launch Sites: Cape Canaveral, Cape Canaveral LC17A. Stages: Able, Thor DM-19. Agency: Douglas. 1958 April 24 - . 00:10 GMT - . Launch Site: Cape Canaveral. Launch Complex: Cape Canaveral LC17A. LV Family: Thor. Launch Vehicle: Thor Able. FAILURE: Thor turbopump gearbox failed T+146 sec.. Failed Stage: 1. Able RTV re-entry vehicle test flight - . Nation: USA. Agency: USAF. Spacecraft: Man-In-Space-Soonest. 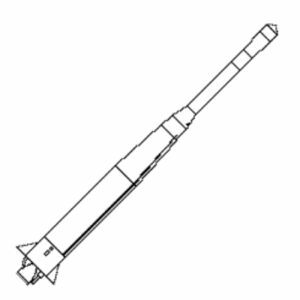 Apogee: 80 km (49 mi). 1958 July 10 - . 02:30 GMT - . Launch Site: Cape Canaveral. Launch Complex: Cape Canaveral LC17A. LV Family: Thor. Launch Vehicle: Thor Able. Able RTV re-entry vehicle test flight - . Nation: USA. Agency: USAF. Apogee: 1,600 km (900 mi). Mouse 'Mia II' reached 1600 km altitude, flew 9600 km range, but re-entry vehicle not recovered. The second Air Force Thor/Able reentry (nose cone) test vehicle, testing a GE ablation-type nose cone, was launched from Cape Canaveral on a 6,000-mile flight down the Atlantic Missile Range. This was the first U.S. reentry vehicle to make a full-range ICBM flight and reentry. 1958 July 23 - . 22:13 GMT - . Launch Site: Cape Canaveral. Launch Complex: Cape Canaveral LC17A. LV Family: Thor. Launch Vehicle: Thor Able. In its second successful flight test, the Thor/Able (Number 1.19) advanced reentry test vehicle demonstrated proper reentry of the advanced General Electric ablative nose cone during a 5,300-mile test flight. Two successful tests established the two-stage Thor/Able as a reliable vehicle for further special test programs. This allowed the Air Force and other government agencies to complete plans for more advanced space programs. Mouse 'Wickie' not recovered; nose cone lost.